Another Hollywood legend has answered the big casting call in the sky. Dom DeLuise – actor, comedian, director, producer, chef, and author – died in his sleep Monday night after a long illness; he was 75. When I think of Dom DeLuise I think of a big happy guy with an infectious laugh. He was also a very talented man. DeLuise generally appeared in comedic parts, although an early appearance (in the movie Fail-Safe as a nervous enlisted airman) showed a possible broader range. His first acting credit was as a regular performer in the television show The Entertainers in 1964. In the 1970s and 1980s, he often co-starred with Burt Reynolds; together they appeared in the films The Cannonball Run and Cannonball Run II, Smokey and the Bandit II, The End, The Best Little Whorehouse in Texas and All Dogs Go to Heaven. DeLuise was the host of the television show Candid Camera from 1991 to 1992. DeLuise was probably best known as a regular in Mel Brooks’s films. He appeared in The Twelve Chairs, Blazing Saddles, Silent Movie, History of the World, Part I, Spaceballs & Robin Hood: Men in Tights. Brooks’ late wife, actress Anne Bancroft, directed Dom in Fatso (1980). He also had a cameo in Johnny Dangerously as the Pope, and in Jim Henson’s The Muppet Movie as a wayward Hollywood talent agent who comes across Kermit the Frog singing “The Rainbow Connection” in the film’s opening scene. An avid cook and author of several books on cooking, in recent years he appeared as a regular contributor to a syndicated home improvement radio show, On The House with The Carey Brothers, giving listeners tips on culinary topics. He also wrote seven children’s books. 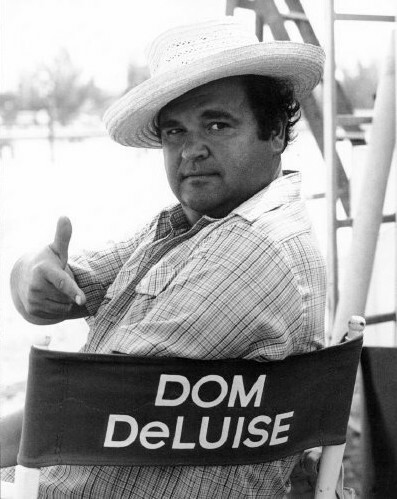 There are a ton of great pictures on the Dom DeLuise website too; this is just one of them.